Traditional 3-Piece Tool Set makes even a novice gardener feel like a master! 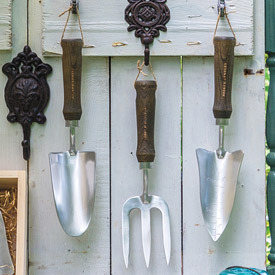 From our friends at Joseph Bentley, this garden tool trifecta includes a classic rounded trowel, a pointed-head transplanting trowel with planting depth gauge and a sturdy hand fork. Working ends are made from polished stainless steel for efficient digging and minimal soil adhesion, and the comfortable contoured oak handles give the tools a beautiful vintage look. The perfect starter set for a beginner or replacement tools for an accomplished gardener who deserves an upgrade. 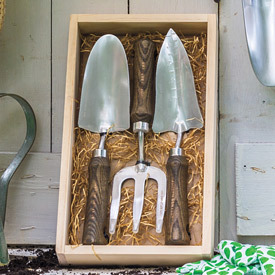 Use the wooden gift box to store seed packets or other garden accessories.